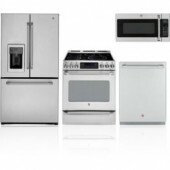 Are you tired of trying to find a complete appliance solution for your home that coordinates colors, fuel types, brands, and all of the other options that come with your appliances? Well, if you want to save your time, money, and frustration with appliance package deals go for an appliance package deals! Weeks ago, I was so busy looking for a kitchen appliance package deals here in our city but to no avail. Since we will be moving to our new home days from now, I have left with no choice but to buy them all in a separate price per appliance. :( Too bad, no savings at all! I hope we can have one store here who'll offer us such like the Goedeker's!